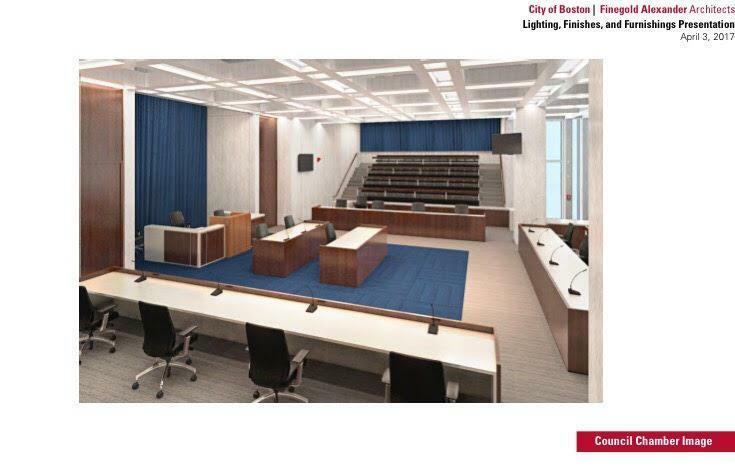 A preliminary rendering of the new City Council chamber. For a few Wednesdays this summer, Boston city councilors will hold their weekly meetings at Faneuil Hall, the site of several historic speeches and major city events. The site change is needed while the council chamber undergoes a $2.2 million upgrade to better accommodate people with disabilities, officials said this week. “This is following up on the accessibility project we have been working on for the last year or so,’’ said council president Michelle Wu, who has been pressing for improved accessibility in the chambers. The Faneuil Hall meetings will be held July 12, Aug. 2, Aug. 23, and Sept. 13. The council typically holds hearings throughout the city, but it’s rare to have its regular Wednesday meetings outside of City Hall. The chamber is the largest gathering spot at City Hall, but it is not an easy room to navigate for people with mobility challenges or wheelchairs. People with canes or walkers have to walk down three steps to get to the main council floor to give testimony. Wheelchair users have to travel down a long hallway to the back of the chamber to access a ramp. For years, people in wheelchairs had used an old ramp that had been hastily installed more than 17 years ago to accommodate Dapper O’Neil, a former city councilor who used a wheelchair for a short period during the last of his 28 years in office. That ramp was replaced last year. City officials said the renovations will include raising the council floor by about 18 inches and leveling the floor. Sound improvements, new lighting, and new furnishings are expected. Seating will be installed to accommodate wheelchair users, officials said. Renovations will take place July 1 through Nov. 1. Wu said the council is prepared to have two more meetings at Faneuil Hall, if needed.